A story that explores a compelling blend between unknown entities and some seemingly true events. Who are the abductors? Where do they come from? Where are they hiding? Do they even exist? Reality or imagination gone wild? After writing his memoirs, the author suspected he may have some mysterious phenomena buried within his subconscious. His first wife had claimed that they had been abducted (by aliens)during their brief marriage. The abductions were revealed to her after they had separated and she adopted an ascetic lifesyle. This melted her implanted memory blocks installed by the abductor’s. He never believed her. He suspected she had a fertile imagination. He was more concerned with putting his life back together after the devestating divorce. But after writing his memoirs, he asked himself “what if she had been right?” There was only one way to find the truth. He adopted the same ascetic liftsyle. O-M-G. He had to rewrite his memoirs. 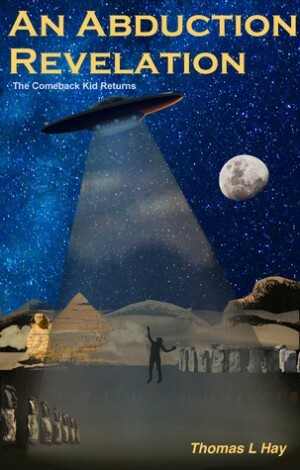 An Abduction Revelation is an intriguing and entertaining adventure based on some true life events of the author. It is a journey filled with mystery, romance, heartbreak, and revelations that will startle and tormentyour reality. Let me start by saying that I am extremely open-minded. I believe in aliens and ghosts and about anything else there is. If I don't believe in it at least acknowledge that it could be true. So I do not doubt at all that someone could be abducted ab aliens but this book was a bit much. It is said to be a memoir for this Thomas L. Hays guy and he was abducted by aliens. I am not saying that he wasn't because he could have been but come on. Not only was he abducted but he was able to meet face to face with these creatures and have a conversation. I'm not going to go into detail about what the aliens were and what they looked like or anything like that because no spoilers here. This book is crazy and highly entertaining. It did make me think differently about aliens and I'm sure it was meant to.